Defra has approved an application from Emergent Product Development UK Ltd to release a Genetically Modified Organism (GMO) as part of a clinical trial to evaluate a vaccine against typhoid. Clinical trials such as this must be authorised by the Medicines and Healthcare Products Regulatory Agency (MHRA). However, in this case, an additional but separate approval from Defra is required because this trial involves the release of a live GMO into the environment. As yet, Emergent has not applied for Clinical Trial Authorisation from the MHRA. 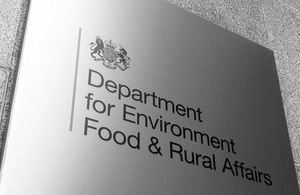 Defra is required to assess the risks to the environment and to people not involved in the trial. The application has been evaluated by the independent expert group the Advisory Committee of Releases to the Environment (ACRE). It is satisfied that the release of this GMO will not have an adverse effect on human health and the environment, providing the required precautionary measures are taken. The MHRA is responsible for regulating the quality and safety aspects of clinical trials, including the safety of participants involved in the trial and ensuring that the required regulatory standards are met. For a clinical trial to proceed in the UK it must have received an authorisation from the MHRA known as a CTA (Clinical Trial Authorisation). Reflecting ACRE’s advice, precautionary conditions have been attached to the consent for the trial. Inspectors will visit the clinic involved in the trial on behalf of Defra to ensure that all the conditions of the consent to release a GMO are being met. Defra has been consulted on this because the trial involves the release of a live genetically modified organism, and it is therefore obliged to assess any risks to human health or the environment from the release and give its approval before the trial can go ahead. It is Defra’s responsibility to assess the safety of people who are not taking part in the trial. It is the responsibility of the Medicines and Healthcare Products Regulatory Agency to consider the risks to human health of those involved in the trial. The applicant (Emergent) will seek authorisation for the clinical trial from the MHRA in March.